Perceptions, pipelines and partnerships are the “three Ps” in addressing the skills gap in Michigan, which are essential to helping the state re-establish its position as an international manufacturing powerhouse. 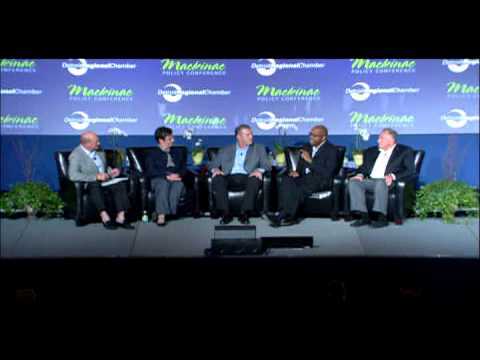 “We’re only as good as our people,” said David Dauch, chairman, president and CEO of AAM, the sponsor of the panel session focused on how higher education advocates and manufacturers are taking on Michigan’s skills challenge. Moderated by Chris Holman, founder and CEO of Michigan Business Network, the panelists included: Stephanie Comai, director of the Talent Investment Agency for the state of Michigan; Bill Pink, the vice president and dean of workforce development for Grand Rapids Community College; John Russell, president and CEO of CMS Energy and Consumers Energy, as well as Dauch, a Detroit Regional Chamber Board member. The panelists stressed the importance of shifting perceptions about skilled trades pointing out that as society has moved from an industrial to knowledge-based economy, skilled trades remain a part of that shift contrary to many misperceptions. As the discussion highlighted, the role of skilled trades is even more critical as manufacturing continues to evolve in the high-tech global economy, offering exciting career opportunities that are in high-demand. Developing partnerships between manufacturers and community colleges is critical to reaching students in high school and middle school and showing them that skilled-trades offer a high quality of life. In order to build this talent pipeline, the panelists highlighted examples of how companies like AAM and Consumers Energy have developed relationships and training programs with community colleges, like Grand Rapids Community College, to get students the skills they need to fill jobs.